It looks like his upcoming nuptials sure are bringing out the best in Kanye West. We recently showed you a video of the hip-hop mogul giving an aspiring rapper the opportunity of a lifetime, when he listened to a few impromptu freestyle bars on the streets of New York. This week, Yeezus brought his congeniality tour to the streets of Paris, when another fan approached West to sign a pair of Kanye-designed sneakers. In the video, he's being swarmed by paparazzi, a scenario that often sends the rapper into full-on fight-or-flight mode. But, that was the old Kanye. 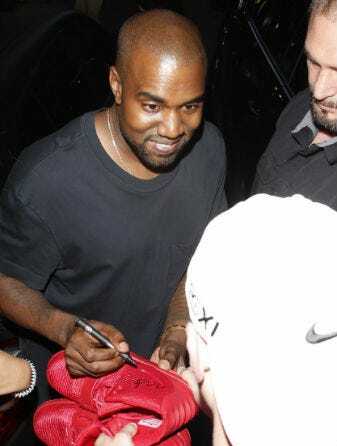 The new Kanye not only signed the sneakers, he had an ear-to-ear grin while doing it.